Carbon monoxide is a very dangerous non-imitating gas that is caused by unburned carbon based fuels. It is truly an invisible killer, that has taken many lives. To be assured that this killer is not in your home, G. Warren Inc. will test the furnace and hot water heater. Our Home Inspector will test the equipment by using a state-of-the-art bacharch analyzer. This test is not just a simple room test, it is a test of the equipment itself. The following is information obtained from the U.S. Consumer Product Safety Commission. 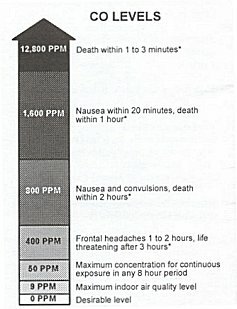 Carbon monoxide is "the invisible killer". Carbon monoxide is a colorless and odorless gas. Every year over 100 people in the United States die from unintentional exposure to carbon monoxide associated with consumer products. The US Environmental Protection Agency suggests that if you suspect that you are experiencing carbon monoxide poisoning, get fresh air immediately. Open windows and doors for more ventilation, turn off any combustion appliances, and leave the house. You could lose consciousness and die from carbon monoxide poisoning if you do nothing. It is also important to contact a doctor immediately for a proper diagnosis. Remember to tell your doctor you suspect carbon monoxide poisoning is causing your problems. Prompt medical attention is important. In a real old colonial house in Central New Jersey, a "do-it-yourself " homeowner installed one of those giant attic fans. It was one of those large fans that required the wall to be opened up and lovers installed. At this point I must point out that this type of house was never designed to have an attic fan. This fan was put in a finished attic area of a very old colonial style home. Well in the month of November when the heating system was turned on, two teenage boys were wrestling around in the finished attic area, they got sweated up and turned the fan on to cool off. Because there were no exterior doors or windows open, the strong fan started drawing air down the chimney. with the furnace running and producing carbon monoxide and the fan drawing the carbon monoxide into the house this situation was a disaster in the making. When the father came home from work, he found the boys staggering around from carbon monoxide poisoning. At first the father thought the boys were drinking beer and were drunk. Realizing the boys were not drunk, the father figured out right away what the problem was and shut the fan off and opened the doors for fresh air. By a stroke of luck the father found the boys in time and avoided a disaster. This story was related to the author at a Home Inspector Seminar. Since that Seminar in 1998, I have inspected four homes that had the same fan/carbon monoxide problem. In fact, one home only had a standard roof vent fan about 9 inches in diameter that was drawing in carbon monoxide via the chimney. The house was sealed tight and the attic vents were completely closed off. The house was sealed so tight that the little fan was creating a strong enough negative to draw air back down the chimney. Every New Jersey Home Inspector at that I have shared this story with was shocked that a simple little house fan under the right conditions could contribute to carbon monoxide poisoning. Two years after I inspected a Cape Cod style home in Central New Jersey, I received a call from the lady of the house, that I will call Mrs. Smith for the purpose of this article. Mrs. Smith told me that she thinks her husband is suffering from carbon monoxide poisoning. She told me that her husband works nights and sleeps in the little bedroom over the furnace and hot water heater. Mrs. Smith said every time he sleeps in this room he wakes up dizzy and with a headache. And, as soon as he goes outside the dizziness clears and the headache goes away. Well, with a call like that and knowing the danger of carbon monoxide, I went right over to the house. The minute I walked into the basement I saw a venting problem with the hot water heater. The Smith's had the heater moved further away from the chimney to have more room at the washing machine. Now the vent pipe was to long and getting the proper draft to draw fumes up the chimney. The heater was old and putting out high levels of carbon monoxide which was now getting into the house instead of going out the chimney. Yes, Mrs. Smith was right! Her husband was suffering from carbon monoxide poisoning. The remedy was simple. They bought a new hot water heater and had it installed back close to the chimney. They also had a carbon monoxide detector installed as a safety alarm. What are the Levels of Concern? Health effects are related to the level of CO concentration and length of exposure. New studies indicate that chronic low level exposure can have serious health consequences. UNION COUNTY NEW JERSEY NJ –HOME INSPECTION UNION TWP NJ 07088 AND AREAS NEAR UNION TWP NJ - HOME INSPECTION BERKELEY HEIGHTS NJ 07922, AND TOWNS NEAR BERKLEY HEIGHTS NJ - LICENSED HOME INSPECTOR CLARK NJ 07066 AND NEIGHBORHOODS NEAR CLARK NJ - FIRST CLASS HOME INSPECTION CRANFORD NJ 07016, AND TOWNS NEAR CRANFORD NJ – HOME INSPECTION ELIZABETH NJ 07201 AND CITIES NEAR ELIZABETH NJ - AFFORDABLE HOME INSPECTION FANWOOD NJ 07023, AND RESIDENTIAL HOMES NEAR FANWOOD NJ – WE HAVE HOME INSPECTOR FOR HOME INSPECTION GARWOOD NJ 07027 AND NEARBY TOWNS TO GARWOOD NJ - WE CONDUCT HOME INSPECTION HILLSIDE NJ 07205, AND CITIES NEAR HILLSIDE NJ – FIRST CLASS HOME INSPECTION KENILWORTH NJ 07033 AND SURROUNDING AREAS OF KENILWORTH NJ - COMPLETE HOME INSPECTION LINDEN NJ 07036, WITH EXPERIENCED HOME INSPECTORS LINDEN NJ – WE HAVE LICENSED HOME INSPECTOR FOR HOME INSPECTION MOUNTAINSIDE NJ 07092 AND RESIDENTIAL HOMES NEAR MOUNTAINSIDE NJ - QUALITY HOME INSPECTION NEW PROVIDENCE NJ 07974 , AND TOWNS NEAR NEW PROVIDENCE NJ – LICENSED HOME INSPECTOR FOR HOME INSPECTION PLAINFIELD NJ 07061 AND CITIES NEAR PLAINFIELD NJ - EXPERIENCED HOME INSPECTOR FOR HOME INSPECTION RAHWAY NJ 07065, AND AREAS NEAR RAHWAY NJ – TOP HOME INSPECTION ROSELLE NJ 07203 WITH REASONABLY PRICED HOME INSPECTION ROSELLE NJ - FREE PRICE QUOTES FOR HOME INSPECTION ROSELLE PARK NJ 07204, AND HOMES NEAR - ROSELLE PARK NJ – FIRST CLASS HOME INSPECTION SCOTCH PLAINS NJ 07076 AND AREAS NEAR SCOTCH PLAINS NJ - WE CONDUCT HOME INSPECTION SPRINGFIELD NJ 0708 , WITH TOP HOME INSPECTOR SPRINGFIELD NJ – LICENSED HOME INSPECTION SUMMIT NJ 07901 AND TOWNS NEAR SUMMIT NJ - CERTIFIED HOME INSPECTOR FOR HOME INSPECTION UNION NJ 07083 , AND AREAS NEAR UNION NJ – HOME INSPECTION WESTFIELD NJ 07090 WITH FIRST CLASS HOME INSPECTOR WESTFIELD NJ - WE CONDUCT HOME INSPECTION WINFIELD NJ 07036 AND AREAS NEAR WINFIELD NJ - ALL G WARREN HOME INSPECTIONS ARE CONDUCTED TO THE STANDARDS OF THE STATE OF NJ HOME INSPECTION LICENSING BOARD AND THE STANDARDS OF THE NACHI HOME INSPECTION ASSOCIATION.